These bears were for family members to keep to remember their loved ones. I was amazed that instead of sad faces and crying, I saw smiles and laughter. Congratulations to Hospice of Cleveland County for turning tears to smiles. Recently I had an appointment with Hospice of Cleveland County (http://www.hospicecares.cc/index.htm) to introduce them to our products. As I sat waiting, I heard voices to my right, and thought I’d take a peak and see what was going on. Numerous people were in the room working on a craft. One had hands full of stuffing, and another was using a sewing machine to piece together material. After a few minutes, I finally asked a lady what they were doing. She shared with me a heartwarming story about the workshop. 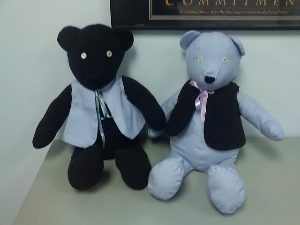 Family members brought in articles of clothing from a deceased loved one, and used that material to make a Memory Bear (http://www.hospicecares.cc/memorybear.htm). Maybe you or someone you know are making a difference in your community. We would love to hear about it. In the section below, please let us know about your business or others that make a difference in your community. Previous postFrom the Field – Whatever Happened to the Free Beer!? !